The Brotherhood of Assassins has a lifelong mission to protect the world from the crushing control of the Templars. The Creed is paramount and must be defended by the worthy few. And, we have seen the skills that have been miraculously passed down through the generations to your skilled kiddo. A master of infiltration and espionage and who could compete with those free-running skills!? It is time to don the mantle of the Assassins (and impress them with a fashion sense that would cow even the Italians). Get armed with dual Hidden Blades or a few firearms and, of course, a trusty blade to wrap around your waist and the fledgling Assassin will be ready to take the Leap of Faith to become a full-fledged Assassin of the Brotherhood! Next step… identify the new incarnation of the Templars! Where might Abstergo Labs be hiding this season? Will your teenage Assassin be the one to stop them? 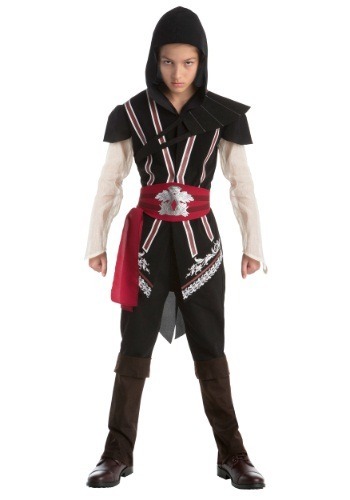 Whether you're hitting the Renaissance Fair or the Halloween party, when you wear this Ezio costume stealth will be the name of the game. We're sure your sneakiness will come in handy when you grab that extra cookie unseen. We believe in you cookie assassin! Play safe, and always, ALWAYS, leave no crumb behind. Size 14/16 Length 26" 26"